Blake Bonner, an Outside Salesperson at our Boise branch, was the recipient of the 2009 Founder’s Award. The annual award is presented to the employee who exmplifies what founder Don McGuire demanded of himself and expected of his employees. 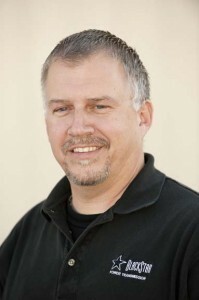 Blake has been taking care of many of McGuire Bearing Company’s customers since 1998 when he joined the company. He is a true leader in these times of uncertainty. He is liked and respected by everyone. Blake has been the epitome of selflessness. He, more than anyone else that I have worked with, has demonstrated the McGuire way, and does so without the need for recognition. He gives 110% to the company every day. Blake’s customers love him and even call him on vacation and he, of course, answers the call. Blake is a leader and a role model. He is extremely dependable and never calls in sick. He never complains. He has a great attitude and is always positive. Blake has taken advantage of all the training materials we have. We could go on and on, but suffice it to say, Blake is extremely deserving of the Founder’s Award. Thank you for all your valuable years of service to McGuire Bearing Company.